The all-new GMC Canyon and Chevrolet Colorado are premium mid-size trucks for those who do not require a full size unit. Not everyone needs full-size capability, but they still expect the strength and true-truck attributes that come in larger models. These two mid-size models are efficient, maneuverable packages for drivers who want the trailering versatility of a truck without the size of a full-size pickup. The all-new GMC Canyon delivers the capability expected of a GMC truck, including a greater maximum payload (1,620 pounds) than competitors. The new Canyon offers a choice of the segment’s best horsepower – you can select 200 horsepower from a standard 2.5L I-4 or the optional 305 horsepower 3.6L V-6 that can deliver a maximum trailering rating (when properly equipped) of 7,000 pounds. Segment-best fuel economy is claimed for these trucks, with 27 mpg highway for 2.5L 2WD models and 26 mpg highway for 3.6L 2WD models. Both of Canyon’s engines are based on award-winning engine families and tuned to deliver the low-rpm torque that customers depend on for hauling and towing. Each incorporates features that enhance smoothness and quietness, contributing to the new truck’s exceptional refinement; and each is backed by a six-speed automatic transmission. A six-speed manual is available with the 2.5L engine in base extended cab/2WD models. Advanced technologies including direct injection and continuously variable valve timing improve power and efficiency, while an aluminum block, forged-steel crankshaft, dual-overhead camshafts and jet-spray piston cooling are additional traits shared by the engines. 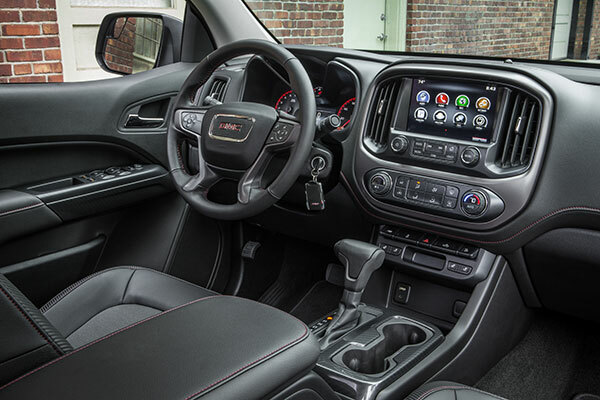 The interior of the 2015 Canyon is designed to be comfortable and well equipped, while delivering the connectivity features that are essential for customers with active lifestyles. The cabin also boasts exceptional attention to detail and premium materials such as soft-touch materials and aluminum trim on the instrument panel of SLE and SLT models. With customers who also own or likely transitioned out of a car, the Canyon’s interior design blends elements of its full-size sibling, the Sierra, with those typically found in more personal vehicles such as sports coupes – including standard front bucket seats and a center console with a floor-mounted shifter. Comfort is enhanced with technologies, connectivity and other features that support owners’ daily and recreational lives including a 3.5-inch-diagonal driver information screen in the instrument cluster (4.2-inch-diagonal multi-color display on SLE and SLT). Interior color choices include Jet Black, Jet Black/Dark Ash, Cocoa/Dune and Jet Black/Cobalt Red (All Terrain). The Canyon is offered in base, SLE and SLT models, in 2WD and 4WD, and with an aggressively styled All-Terrain package offered on SLE models. It includes 17-inch painted aluminum wheels wrapped with all-terrain tires, a body-color grille surround with horizontal chrome bars, a body-color rear bumper, front tow hooks, hill descent control and specific suspension tuning. It also includes a power-adjustable front passenger seat. The front suspension uses aluminum steering knuckles that are low in mass and high in strength, contributing to the responsive driving experience and enhancing efficiency. The electric power steering system also enhances efficiency because it does not draw power from the engine. Additionally, the Canyon has a tight turning radius of 41 feet, making it easier to maneuver when parking or backing into tight spots, such as garages or campsites. The rear axle is available with the GM’s venerable “G80” locking differential, which gives drivers a traction advantage when needed and everyday comfort when it’s not. It reacts in milliseconds in low-traction situations to improve safety and confidence on wet, snowy or muddy surfaces. Without driver input of any kind, the rear axle engages when a wheel speed difference of 100 rpm or more is detected between the left and right wheels, providing instant traction for confident driving. During normal driving conditions, the differential functions as a conventional light-bias limited-slip axle. Bold front-end styling incorporates the segment’s only standard projector beam headlamps and GMC’s signature LED daytime running lamps on all models. Three body configurations are offered: An extended cab model with a six-foot two-inch bed, a crew cab with a five-foot two-inch bed, and a crew cab with a six-foot two-inch bed. With the tailgate down, the longer bed allows eight-foot-long items to be hauled within the vehicle. We were very impressed with the segment-first EZ Lift-and-Lower locking tailgate that uses an internal torsion bar to make raising the tailgate easier with one hand, and a damper for more-controlled lowering. It is standard on SLE and SLT models, and available on base models. There are thirteen reconfigurable and four stationary tie-down locations throughout the bed for use with available, removable cargo tie-down rings, and you can order a factory-installed spray-on bed liner. Work and lifestyle accessories were developed in tandem with the Canyon to match the truck’s capabilities with integrated functionality and designs that complement its distinctive styling. The lineup includes the all-new, patent-pending GearOn™ system and a variety of accessories designed to make cargo hauling easier and more convenient, as well as exterior styling enhancement and interior items. The GearOn™ system is designed to fit perfectly within the bed, for significant storage and hauling flexibility. It is upgradable, with modular cargo dividers and tiered storage to accommodate 4 x 8-foot sheets of plywood above the wheelhouses. OnStar with 4G LTE and standard built-in Wi-Fi provides a mobile hub for drivers and passengers to stay connected. The hotspot is on whenever the car is on and comes with a three-month/three-gigabyte data trial, whichever comes first. The Canyon has available driver alert features such as forward collision alert, lane departure warning and a standard rear-vision camera. The Canyon is the only truck in the mid size segment to offer AutoTrac automatic four-wheel drive, which allows the driver to select manual 4WD engagement or automatic engagement. 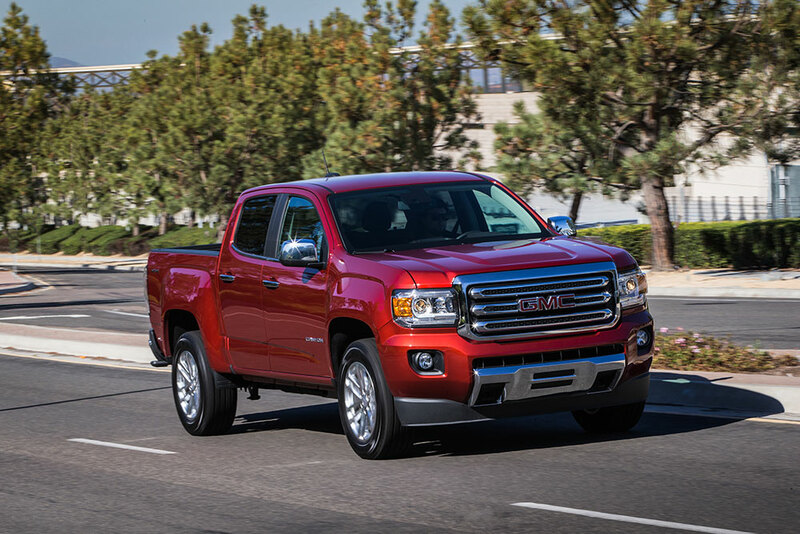 From a refinement standpoint, the Canyon features triple-sealed doors inlaid in the body sides, like the 2014 Sierra, for improved aerodynamic performance and a quiet interior. It also features the segment’s first active aero grille shutters, which close at certain highway speeds to enhance efficiency through improved aerodynamics. A fully boxed perimeter frame provides the strength to support its capabilities, and a ride designed to be smooth and quiet. Like the full-size Sierra’s frame, the Canyon comprises of three sections – or bays – with specific strength and support characteristics, including a front bay made of hydroformed side rails and an integrated four-point front axle mounting system designed to reduce vibration. Four-wheel disc brakes, with four-piston front calipers are standard and feature segment-first Duralife™ brake rotors – also pioneered on the 2014 Sierra. They can offer up to double the service life, which can help lower ownership costs. They enhance braking performance, too, thanks to a GM-exclusive process that protects against rust that, over time, can lead to steering wheel shudder. It involves super-heating the rotors to more than 1,000 degrees F (560 C) for an entire day in a special oven, where the nitrogen-rich atmosphere promotes nitrogen atoms to bond to the rotors’ surfaces, hardening and strengthening them. GM provides the ProGrade protection program, delivering two years/24,000 miles (whichever comes first) of scheduled maintenance. It is standard on all models and covers four services of an oil change, tire rotation and 27-point inspection. It complements the three-year/36,000-mile (whichever comes first) bumper-to-bumper limited vehicle warranty and five-year/100,000-mile (whichever comes first) powertrain limited warranty for peace of mind. Previous articleProLite Names “Jerry’s RV” Its Top Canadian Dealer!